Is your refrigerator a disaster of half eaten leftovers? Do you sometimes reach into the back of your produce bin and find the spinach you bought with good intention has been forgotten and turned to slime? Be honest. Are there two jars of olives and three bottles of ketchup because when you’re at the market you can’t remember what you have on the door of your fridge? You need a game plan to organize your icebox. 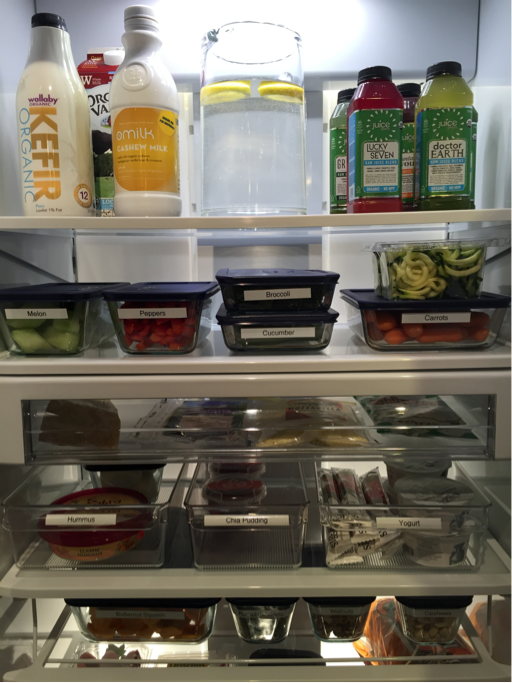 A well organized, well stocked refrigerator is a simple tool to help you make healthy, clean decisions. Here are some tips to set you up for success. It will take 20 minutes, so plan your playlist accordingly. Healthy people eat whole foods. Most of your refrigerator should be loaded up with veggies, produce and ingredients, rather than grab and go foods. The exceptions are things like hummus, hardboiled eggs, guacamole, cheese and yogurt, which pair nicely with – you guessed it – veggies! Use your doors for fun and exciting condiments, like sambal olek, salsa, high quality homemade salad dressing as well as your staple go-to’s of flax meal, almond flour and fish oil. See that? There’s no room for trigger foods, empty calories or going to the packaged snacks. A clean fridge that is well stocked is key to setting you up for success. Don’t forget to post a pic! We’d love to see your work!